Consumer Cooperatives: An Alternative Institutional Model for Delivery of Urban Water Supply and Sanitation Services? This paper describes the essential characteristics of consumer cooperatives engaged in the provision of basic services and discusses their applicability as a model for water supply and sanitation service provision in urban areas. A cooperative is an autonomous association of persons united voluntarily to meet their common economic, social, and cultural needs and aspirations through a jointly-owned and democratically-controlled enterprise. The paper focuses on system-wide urban water supply cooperatives and it is thus not concerned with urban or peri-urban cooperatives that depend on either boreholes or bulk purchases of water from a utility for distribution, nor does it refer to rural water supply cooperatives that are generally small. After a general overview of cooperatives and a discussion of the main characteristics of utility cooperatives, the paper reviews the case of SAGUAPAC, a successful urban WSS cooperative in Bolivia, from which it draws some conclusions in the form of a preliminary assessment of cooperatives as a model for delivery of urban water supply and sanitation (WSS) services. Copyright 2006 The International Bank for Reconstruction and Development/The World Bank. All rights reserved. 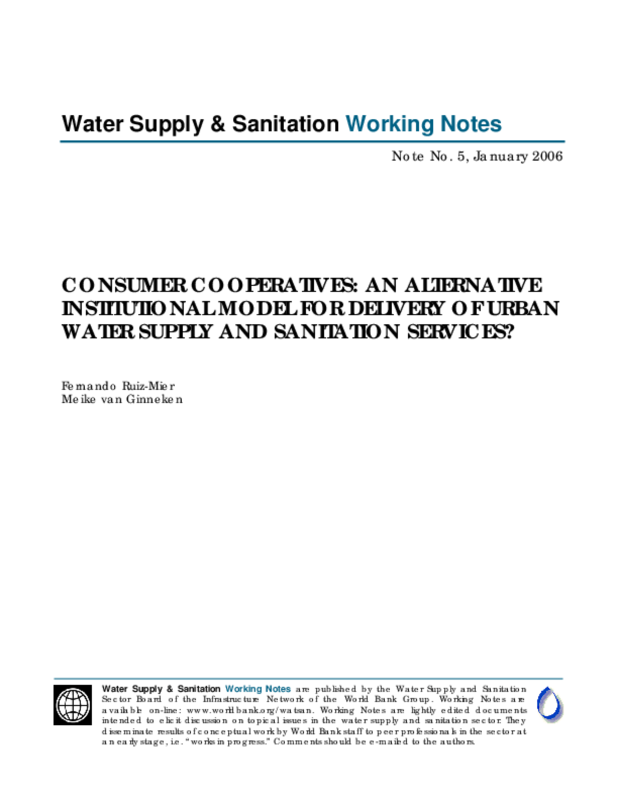 Title: Consumer Cooperatives: An Alternative Institutional Model for Delivery of Urban Water Supply and Sanitation Services?